TAKE THE HIGHWAY FROM MANCHESTER TO CHINA AND BACK - not the Silk Road or the Trans-Siberian Railway but a high-capacity electronic link which was officially opened by Tony Blair last Wednesday during his official visit to China. UK universities are lniked together via JANET - the UK Joint Academic Network, which is based at Manchester University. JANET is now in direct contact with the corresponding computer network in China. The link will be used to promote academic collaboration between the UK and China - students can keep in touch with their supervisor on the other side of the world, participate in seminars or attend lectures via videoconferencing, or chat with their friends at home. This could mean that Eyewitness in Manchester readers in Guangzhou, Beijing or Tsinghua will be able to download this page in just a few seconds - is there anyone out there who'd like try this out? Have a glass of my favourite Chinese beer, Tsing Tao, on me! ANOTHER MANCHESTER-CHINA link up took place on Friday, when the UCI cinema hosted the regional premiere of the new Walt Disney film Mulan - proceeds went towards helping people in Manchester's twin town of Wuhan, where the Yangtze River recently burst its banks. THE FREE TRADE HALL HOTEL TOWER PROPOSAL has now been well and truly laid to rest. I reported the news of the rejection of the plan as soon as it broke last Thursday evening. Deputy Prime Minister John Prescott took the decision in his role as Secretary of State for Environment and the Regions, and described the scheme as "fundamentally flawed". But Councillors Richard Leese and Pat Karney of Manchester City Council are, to put it mildly, disappointed. Pat Karney pointed the finger of blame at Civic Society "trendies", saying: "I hope those people who are out of work will now write to the Civic Society". Councillor Leese said it was "bad news for the city, bad news for jobs and bad news for the building which will now sit there doing nothing for a long time." TAKE THE TRAM TO THE TRAFFORD CENTRE - BUT WHEN? It's difficult to answer this question at the moment, due to conflicts of interest between those in favour and those against. Trafford Borough Council is in favour, but outlying boroughs such as Oldham are less keen - for understandable reasons: Why should they approve a plan enabling even more people to go and spend their money at the Trafford Centre, and not in Oldham, or wherever. Currently, the latest Metrolink line is being built through Salford Quays and along Regent Road, which is one long building site at the moment. The line will end at Eccles. Town councils including Bolton, Rochdale, Stockport and Warrington, are coming up with their own publicity campaigns to beat off the competition from the new shopping goliath in Dumplington. Ryan Giggs is to be drafted in again to pull shoppers into Manchester's Arndale Centre, as part of a half a million pound campaign. Now that every day of the week is a shopping day in the run-up to Christmas, the battle of the shopping centres will be long and hard. And it will be taking place not only before but during the festive season. Can you guess which shopping mall will be open on BOXING DAY? Yes, you guessed it, the Trafford Centre! BUT TRAGEDY OCCURRED at the Trafford Centre on Saturday when a little boy was killed - Sam Adams, aged six, died in Hope Hospital, Salford, after a cast iron railing fell on his head while he was in the Orient area of the centre. It seems inconceivable that a tragedy like this this could occur like this. 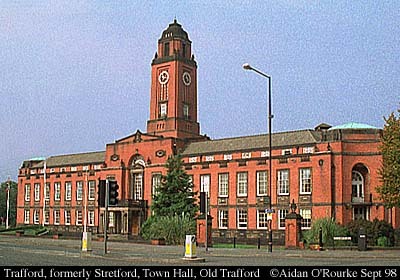 Trafford Borough Council have begun an inquiry, and Trafford Centre bosses have begun their own inquiry. The incident raises many questions: Were safety standards adhered to properly in the rush to complete the centre on time? Will it cast a negative shadow over the Centre? The superstitious may regard it as an ill omen. Whatever the cause, our sympathies must go to the parents, Dawn and Paul Adams, of Altrincham. ANOTHER TRAGEDY IS THE SUBJECT of a court case in progress currently at Preston Crown Court. Paul Seddon is accused of the murder of 5 year old Dillon Hull in Bolton in August of last year. The bullet which killed the child had been intended for the child's stepfather, John Bates. The murder is drug-related. Paul Seddon denies the charge. AND LAST WEDNESDAY, THE KILLER OF A CHINESE STUDENT was put away for life for the murder of Taiwanese student Chin Yu Chang. Karl Connerton, aged 20, stabbed him in Whitworth Park and stole £25. Two others, John McDonagh and Robert Hill, who were with him were also jailed. They used the money to buy drugs in Moss Side. I'll never forget seeing the origami birds tied to the Whitworth Park railings next to the Art Gallery. They were put up the victim's father, Din Chang. Fears that the city's reputation would put people off coming here to study have proved to be unfounded. The number of Taiwanese students coming to Manchester has remained constant. If you want to read an American view of Manchester's night club and drug scene, illustrated by my photographs, have a look at the Atlantic Monthly article, now online at www.theatlantic.com/issues/Oct1998/, and tell me what you think. And talking of pictures, an MEN a competition hopes to find the definitive pictures of Manchester's architecture at the Millennium, taken by amateur or professional photographers. 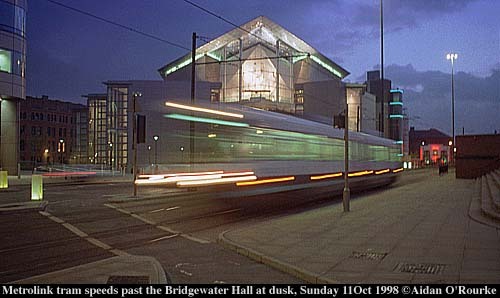 The brief is: "Which buildings best define Greater Manchester as it approaches the year 2000?". Prints can be sent to Manchester Image 2000, MEN, 164 Deansgate, M60 2RD. The competition is sponsored by the Evening News in association with property consultants Lambert Smith Hampton. And I've been notified of two new locally-based websites: Debbie Fair, Glossop's foremost Internet publisher, of Phenomena Online fame, has done a "Royle Family" website, in honour of the new cult comedy drama "The Royle Family" shown on BBC2 Monday night at 10pm, and starring Caroline Aherne. The website is at www.phenomena.ndirect.co.uk/roylefamily/front.htm. Also have a look at The Net Curtain a new e-zine with both Manchester and non-Manchester features. The Type 42 destroyer HMS Manchester was given freedom of the city on Saturday - unfortunately the vessel is too big to come up the Manchester Ship Canal and is docked in Liverpool. The Lord Mayor Gordon Conquest inspected the ship's company on Albert Square on Saturday. Freedom of the City grants the right for the crew to march through the streets of Manchester "colours flying, drums beating and bayonets fixed." But for many years, Manchester has been a "nuclear free city" - only recently there was an exhibition in the Town Hall showing the horrors of nuclear war as seen in Hiroshima. Though most of the "Nuclear Free City" signs around the city borders have been replaced with yellow Commonwealth Games 2002 signs, the city council adheres to the "nuclear free" policy. 14 years ago, Manchester City Council refused to attend a reception on board HMS Manchester, and banned the Red Devils parachute team and Army bands from the Manchester show. But now, the Council decided to give freedom of the city ot HMS Manchester, and the crew definitely appreciate it: "The conferment of the freedom of Manchester is a great honour indeed" said ship's spokeswoman Lieut. Commander Pam Healy. There was mostly rain-free weather, with some bright periods, for the Manchester Marathon, yesterday. Hundreds of runners pounded their ligaments on a meandering route from Heaton Park in the north to Wythenshawe Park in the south yesterday, causing widespread disruption to drivers across the city, myself included! Bashir Hussain, of Stockport, came in first with a time of 2 hours, 23 minutes and 23 seconds. His girlfriend Jackie Newton was number one female, taking 2 hours 53 minutes and 56 seconds. David Holding was the fastest wheelchair competitor, with a time of 1 hour 47 minutes, and sole female wheelchair user Deborah Brennan took 2 hours 54 minutes and 23 seconds. Michael Cook, of Hulme and Maria Burden both came in last together with a time of 7 hours 27 minutes and 36/39 seconds respectively. THERE MUST BE EASIER WAYS OF GETTING FROM HEATON PARK TO THE SOUTH OF THE CITY - Metrolink perhaps, or my preferred option: bicycle. The current EWM temperature is 50/10 degrees. Aidan , I was delighted to see the photograph of the Cat and Fiddle . Though it was taken under poor conditions it still gave me goose bumps . Aaaah but how the memories are given life . Your blood is worth bottling . Thanks again for the time and effort you put into this site . Thanks very much - A sunny Cat & Fiddle coming soon! No problem, the time and effort is fun! JUST WONDERING IF YOU HAVE EVER TAKEN ANY PIC'S OF MOTOR CYCLE SHOPS AROUND MANCHESTER? ANYWAY, I'LL SEE YA NEXT WEEK . I have one of a motorcycle show at G-MEX. Go to the Image Collection and do a search for "motorbike" or "motorcycle" and you should find it! Nice to hear it, especially from someone not from Manchester! Don't know if you know of the people or of the site, but it was listed in today's Guardian. Its http://www.thenetcurtain.com/. By the way, I didn't know Manchester had such blue sky as in the Corn Exchange (sorry Triangle) picture! :-) Nice use of filter. Was that a Photoshop or real filter? 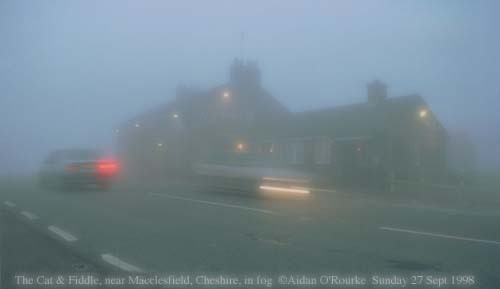 The Cat and Fiddle is good in the fog, with your copyright foggy as well! Good stuff. The best news though is the stopping of the Trade Hall 'pole'. Even though Manchester is the second largest building site to Berlin, the new stuff should keep some of the character of Manchester and it history which is very important. Subject: what else ? "photos"
Hello Aidan, Firstly many thanks for your magnificent photo's of M\c, after 34 yrs in OZ it's good to keep up with the changes, but search as I can , I can't find any of the area where I was born and bred namely All Saints, Hr Ormond St, Cavendish School, Hr Ormond St school etc preferably around the 1934 (d.o.b.) to 1950 when we moved to Northern Moor (an outpost then!!!) . If you could point me in the general direction to search , I would be grateful. As I am about to purchase a Ricoh 4300 digital camera (res of 1280x960) and really excellent macro , I wondered what you use for your web photo's?, and one more question if you don't mind , how did you get that photo of the Cat & Fiddle on the 28th Sept, Talk about bringing memories back, I once got snowed in there and had to wait for the snowplough, gosh it was to take !!!!!!. Thanks for allowing me into your world of photo's. Some photos of that area - now part of the Manchester Metropolitan University (formerly "The Poly") - coming soon. I use my trusty and battered Nikon FM with various lenses. The Kodak DC20 is for small shots and experimenting. Hoping to use a high end Nikon digital camera very soon. The search resource on your Image Collection is a good idea, but it really takes up too much of the screen and cuts into the viewing space of your wonderful pictures. Couldn't you put it somewhere where it wasnt so intrusive? I like to see as much of your pictures on the screen as possible and it's not the same just having a third of the picture and having to pan up or down. Screen space is a problem - less so if your monitor is set to 800 x 600, as is the case with more and more computers nowadays. I'll have a look and see if I can adjust the size of the frames. Does anyone else have this problem? Congratulations on an excellent job. The most entertaining evening I've had in a while. As a M/c girl, came to Australia in 1956, I would love to see earlier dates. [I was born in 1943 in Gorton]. the years 1939 to 1945 would be partivcularly interesting. Once again congratulations. More Please. Just a letter showing my appreciation of the efforts you put in to provide pleasure for so many people. MEN & EYEWITNESS has been my favourite site for many moons now. The city has changed enormously since I left in June of '57 and it's hard to visualize the many changes, but your pictures help a lot. I still cannot pinpoint the whereabouts of Trafford Centre. I recall Trafford Bar, White City Racecourse, Trafford Bridge, United's Ground & Stretford Grammar. I seem to think Trafford Centre is opposite White City where Lookers car dealership used to be. I moved to M/cr as a 13 year old in June of '47 and lived at Hullard Hall P.O. on Stretford Rd until leaving for Canada in '57. Three doors away from where I lived (at the junction of Stretford Rd. and Cornbrook St. was a Billiard Hall which became "Kings of Oxford" motorcycles, a place I visited quite frequently and probably a leverage on my choice of careers. I believe it is back to being a Billiard Hall once again and would appreciate a picture of it if at all possible. A final word to let you know we awoke this a.m. to about three inches of snow on the ground and it's still snowing. I guess this could slow down my business for a while (motorcycle business). The snow may be here early but believe me our winters usually provide lots of large, clear blue & sunny skies, unlike the rain and clouds of Manchester. Once again Aidan, Many Many Thanks for all your efforts, they are most appreciated. 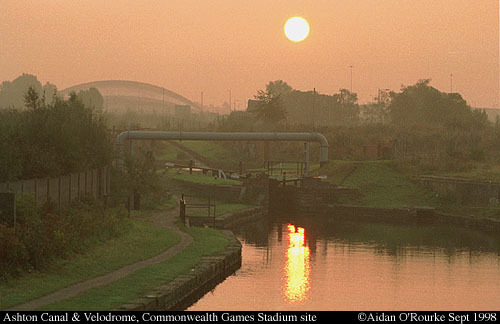 The Trafford Centre is at the far end of Trafford Park, close to the Ship Canal. I'll do a photo of the billiard hall on Stretford Road next time I'm down that way. Thanks very much indeed for your comments, they really make my day! HI AIDAN. I WAS BORN AND RAISED IN M/C. WENT TO ST. AIDANS SCHOOL (IT WAS THEN ST. HILDAS ! ) I NOW LIVE IN FLORIDA, ITS SO NICE TO HAVE NEWS FROM HOME, MY BROTHER, WHO LIVES IN NEW JERSEY DID HIS APPRENTICSHIP AT METRO VICKS, I WORKED FOR A TIME AT FERRANTI HEALD GREEN. Nice to hear from you - Please keep visiting Eyewitness in Manchester and Manchester Online!